I'm pretty sure that these two are fooling around. I'd like to know what kind of spider they are. The male and female look so different. The female (the white one, I'm assuming) is a bit less than 1 cm. These two are Dr. Jeckyll and Mr. Hyde. The smaller male is the caring and careful doctor, and the female is the ruthless killer who often eats her partner after mating - and that's no fairy tale! Check the genera on this Guide page and see what you think. Oh, I wonder if the little guy knows what's going to happen next! OUCH! I wanted to thank you again, Robin, for the info and the links (guide page, etc) I'm not an official bug person but I've always been fascinated with bugs of all types. I'll keep looking! I just submitted a photo of an adult female crab spider beginning to devour her mate after... well, after. When I took the photo I wasn't sure what she was eating, but after seeing it enlarged on the screen and doing a little research, I discovered that he had been demoted from Mr. Lovey-Dovey to Mr. Snack. 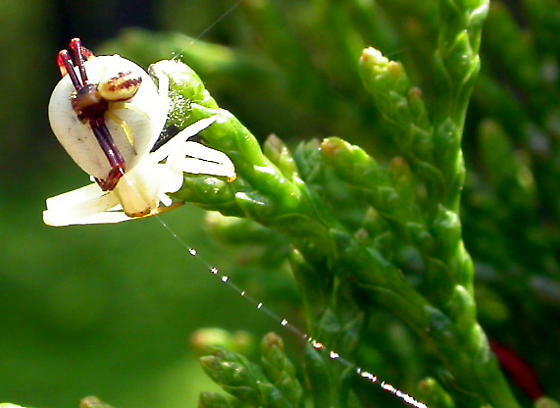 Crab spiders are fascinating creatures!